Cinco de Mayo (May 5th), a national holiday in Mexico, marks the anniversary of the Battle of Puebla, when against overwhelming odds, the Mexican Army defeated French forces. To commemorate the victory and acknowledge their ancestry, many Mexicans in the US and around the world will participate in parades, dancing, mariachi bands, and festivals that are part of the celebrations. Traditional Mexican food along with Dos Equis and Corona beer is often served or sold. Thanks to American marketers, Cinco de Mayo celebrations are bigger in the US than in Mexico. Adding color and spice, this holiday has introduced cultural favorites such as piñatas, bright costumes, tacos, and Cinco de Mayo celebrations to mainstream America. For restaurants, grocery and party supply stores, and the food and beverage industry, Cinco de Mayo has become a much anticipated crossover event. In addition to the US population of Mexican descent, marketers have promoted Cinco de Mayo celebrations to everyone in the US, creating a major, revenue-generating juggernaut. At nearly 34 million, Mexican Americans are a formidable presence in the US. They are living in every state and in nearly every county. As expected, counties in the border states of California, Texas, and Arizona, as well as New Mexico show the highest numbers of Mexican Americans. Starr County, Texas tops the list. The Mexican American population there is 59,339, or 96.7 percent of the total county population of 61,351. At the other end of the spectrum, small rural counties in the South, Midwest, Upper Midwest, and parts of New England show very low or no Mexican American populations. Pew Research states that Mexicans are the largest Hispanic-origin population in the US, accounting for nearly two-thirds of the US Hispanic population in 2012, and comprise 11 percent of the total US population. Between 2000 and 2010, the population increase was primarily due to immigration; however, as job opportunities in the US have slowed, births are producing the majority of the most recent growth. 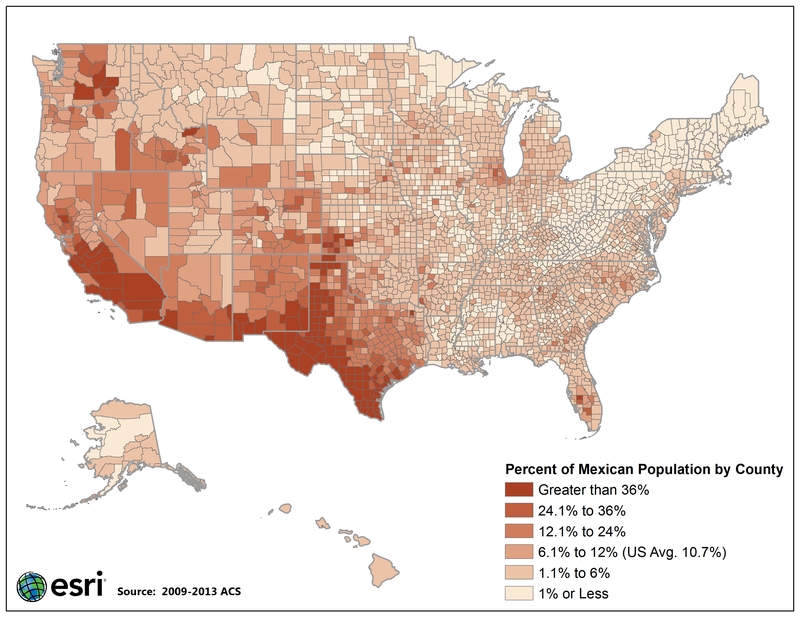 According to Census 2010 data, the US population of Hispanics of Mexican origin increased by 54 percent and had the largest numeric change (11.2 million), growing from 20.6 million in 2000 to 31.8 million in 2010, and they accounted for approximately three-quarters of the 15.2 million increase in the US Hispanic population from 2000 to 2010. Pew Research also noted that a record 33.7 million Hispanics of Mexican origin lived in the US in 2012. This estimate includes 11.4 million immigrants born in Mexico and 22.3 million born in the US who identified themselves as Hispanics of Mexican origin. American Community Survey (ACS) data was used to create this map of the US by county that shows where Mexican Americans are located. As expected, high percentages of Mexicans live in Texas, New Mexico, California, and Arizona, states that border Mexico. For example, 96.7 percent of the population in Starr County, Texas is Mexican; 77.9 percent in Santa Cruz County, Arizona is Mexican. Other counties with high percentages of Mexican populations include Clark County, Idaho (45.8 percent); Seward County, Kansas (51.7 percent); and Adams County, Washington (57.6 percent). Conversely, only 0.5 percent of the population in Broadwater County, Montana is Mexican, and only 0.8 percent in Halifax County, North Carolina is Mexican. Lack of education and language skills may hamper many Mexican Americans from landing good jobs and establishing solid career paths. Pew states that median household income for US-born Mexican Americans is higher generally than for Mexican immigrants—$22,000 versus $19,000. Because children and grandchildren of immigrants seem to assimilate more smoothly and in greater numbers than their elders, the educational and income gaps with native whites tend to narrow for second and third generation Mexican Americans. Over the years, Mexican American musicians, politicians, entrepreneurs, and others have made significant contributions to American life. Actors Jessica Alba, Eva Longoria, Edward James Olmos, Anthony Quinn; athletes Tony Romo, Manny Ramirez, Mark Sanchez; musicians Joan Baez, Carlos Santana, Selena; comedians George Lopez, Louis C.K., Cheech Marin; Bill Richardson, Julian and Joachin Castro, and Henry Cisneros are among the names that are recognized in nearly every US household. Read more about the ACS data and Esri’s methodology.